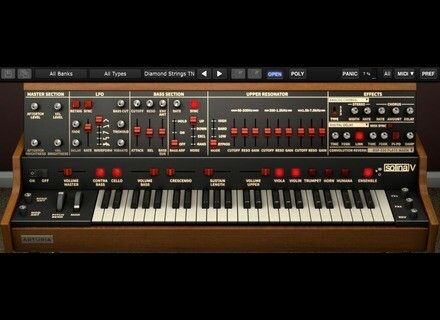 Solina V, Virtual subtractive synth from Arturia. The information provided on this page is merely a guide and does not necessarily constitute the final price and conditions of the product. Prices shown here are subject to errors including, but not limited to, typographic errors, technical limitations, prices that may not be up-to-date, and mismatch errors that may arise between which product is shown on the dealer feed and Audiofanzine. Final prices and conditions are provided by dealers on their web sites. Only the prices shown on each dealers' website constitute each dealers' final sale price. Audiofanzine is not responsible for problems arising from disparities between product prices. Did you see an error on this page? Do one or more shop offers not correspond to the product "Arturia Solina V"?